Brief Description: Brown or black spots on grass blades that widen, develop tan centers, and kill the blade above the roots, sometimes followed by a “melting out” phase defined by a reddish mold affecting the grass blades. The group of fungi that causes the class of lawn disease known colloquially as Leaf Spot was once called Helminthosporium and is still sometimes referred to as such for convenience, though the group label has since been judged by the scientific community to be inaccurate. Individually, the fungi that cause Leaf Spot are called Drechslera, Bipolaris, and Exserohilum. In bluegrasses, Leaf Spot is most active during hot, humid weather, whereas in Bermudagrass it is more active in cool, damp weather. The disease originated in grasslands, where the taller grass was more resistant to the damage Leaf Spot can cause. Leaf Spot is initially similar in appearance to damage caused by drought or insect activity, and can be difficult to tell apart. This can be problematic, because whereas watering a drought-damaged lawn can improve the lawn’s health, watering a lawn with leaf spot can actually encourage the growth of the disease. Leaf Spot grows in random patterns across the lawn rather than in particularly shaped clumps. It is most active in the summer on bluegrass lawns, and in spring or fall on Bermudagrass lawns. 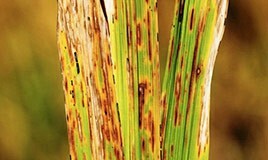 When the infection spreads to the roots of the affected grass blade, the “melting out” phase occurs wherein the roots and crowns of the plants rot, accompanied by the appearance of reddish mold. To prevent Leaf Spot, avoid cutting grass too low. Longer, thicker-bladed grass is more resistant to the damage the spots can do to the grass blade. Adding nitrogen to the soil during a Leaf Spot infection can kill of the affected areas entirely. Avoid overwatering Leaf Spot-infected grass, and aerate the soil to promote water drainage during wetter months. Fungicides should only be applied to lawns infected with Leaf Spot during the disease’s initial stages. Fungicides applied during the “melting out” stage of the disease will have little to no effect. For optimum effects, fungicides should be applied once in early spring and a second time in late spring.